See U(you) is an ASP.NET 2.0 web application, featuring photo gallery, advanced search with Live Search, WikiPedia annotation, Virtual Earth geomapping, blogs, localization, and much more. 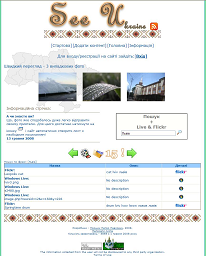 This web site is about culture and nature’s beauty of Ukraine. Developed for ASP.NET contest organized by Microsoft in 2008. A description in Ukrainian language might be found in the following presentation.